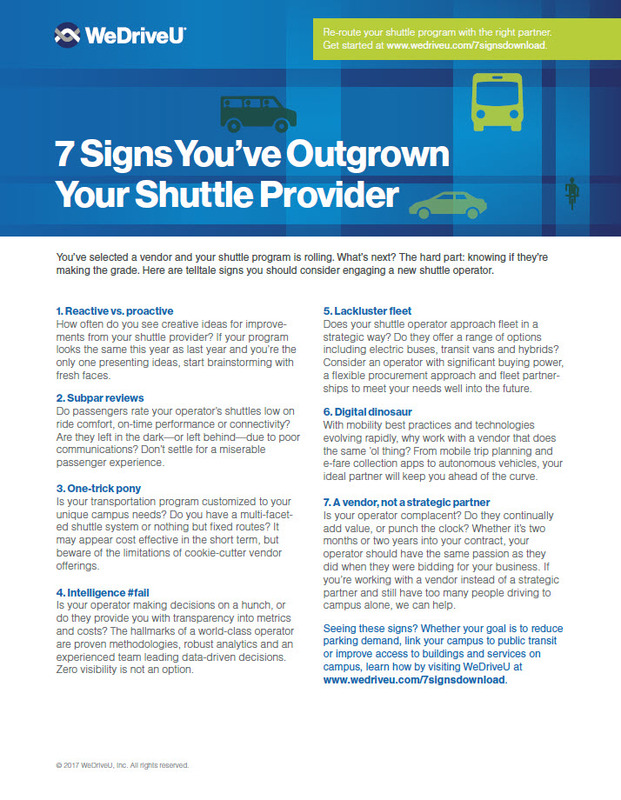 Download WeDriveU's "7 signs you've outgrown your shuttle provider"
Seeing these signs? Help’s on the way. You’ve selected a vendor and the shuttle program is rolling on your university or college campus. What’s next? The hard part: knowing if they’re making the grade. Here are telltale signs you should engage a new shuttle operator. Does your vendor lack creativity? Are improvements few and far between? Do riders complain about ride comfort, on-time performance or wifi connectivity? Is the program one-dimensional, or is it custom-tailored to your organization’s unique needs? What else should you look for? Find more signs and ACTION STEPS in this free e-guide. Please contact me. I'd like to know more.